Waves in the ocean are created when the wind causes frictional drag on the surface of the water, causing forward movement of the water. Waves vary widely in size and strength, depending upon the speed of the wind and how much drag it creates on the surface of the water. Size and strength is also affected by man-made factors, such as boats and other watercraft. 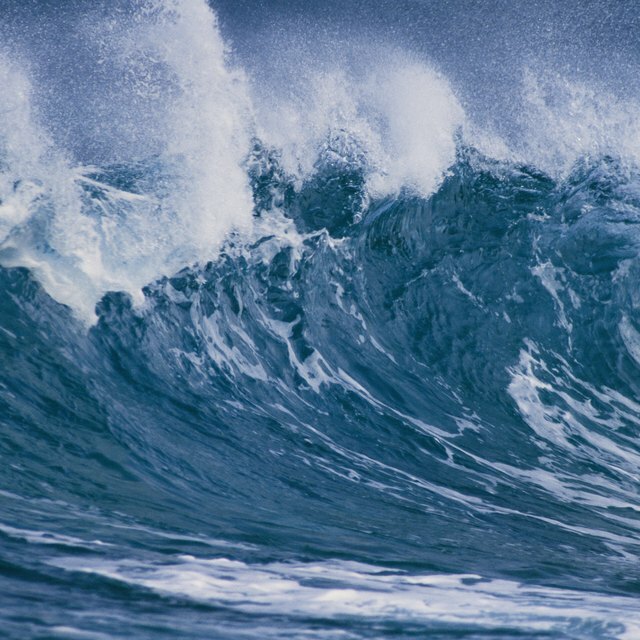 When a wave becomes too high relative to the depth of the water, it can no longer support its own weight and topples to the shore, resulting in a breaker. Even though it looks as though waves are moving forward, in reality only a relatively small amount of water is displaced, and what you actually see is a transfer of energy. Energy continues to move through the water until the wave breaks in the shallow water near the shore. Waves occur in groups called "wave trains." As the wave train continues to the shore, the waves in the train are forced closer and closer together. As a wave approaches the shore, it grows in height and steepness as the water gets more shallow. Eventually, the waves grows to the point that the water isn't deep enough to support it. At this point, the wave topples, or "breaks," which results in a breaker. There are different types of breakers, with the main ones being "spilling breakers" and "plunging breakers." Spilling breakers tend to be more turbulent than other breakers and, as such, are a favorite of surfers. These breakers are formed when turbulent water with foam begins cascading down the front of the wave. Spilling breakers are formed on shores that are completely flat or shores that have a gentle slope. They roll for a significant distance before they break. Plunging breakers are formed when the bottom of the wave rises suddenly toward the shore. An air pocket is created in the wave when the crest folds over, which is followed by a splash-up. An expert surfer can navigate under the falling crest to ride in the air pocket. However, these breakers are very destructive and have enough energy to launch large rocks into the air and damage buildings over 100 feet above the surface of the water. Virtual NJ Shore: Waves, Tides and Currents - How Do They Work? Adam Blevins is a professional drummer, percussionist, writer and educator residing in Birmingham, Alabama. He has written on a wide range of topics including music, digital recording, teaching and technology. Blevins has had articles published on various websites as well as for local print media. Blevins, Adam. "How Breakers Form in the Sea." Sciencing, https://sciencing.com/breakers-form-sea-8788671.html. 24 April 2017.